The inmates of Gotham City’s Arkham Asylum are loose, and Batman is in hot pursuit of The Joker, the Riddler, Poison Ivy, Killer Croc, Scarecrow and more. Pushed to the limit, the Dark Knight comes face to face with Bane, a hyper-pumped-up monstrosity, who delivers a crippling blow that changes Batman’s destiny forever. Batman: Knightfall Vol. 1 presents the epic battle between Batman and one of his greatest foes of all time, Bane. 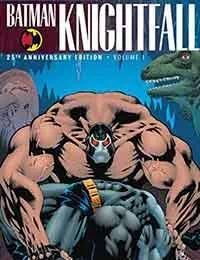 Part two of a massive nine-volume celebration of the entire Batman: Knightfall saga, this collection follows the story arc begun in Batman: Prelude to Knightfall and features Batman #492-497 and Detective Comics #659-663 along with supplemental character sketches and more.